The remains of USK in Wards being scraped. She was built in 1948 for J MURPHY and used as a aggrigate carrier. Seen here in 1973. The former hopper barge USK was used on the Thames as an aggregates carrier by J Murphy & Sons Ltd, of London N5. 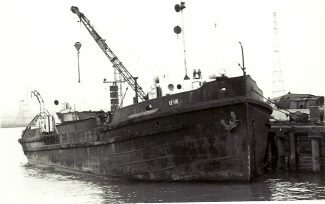 Murphy owned several dredger and aggregates carriers that were seen almost daily on the river, and these included an old “favourite”, the Panamanian-flagged dredger A A RAYMOND, which in the 1960s did a daily trip to the estuary to dredge sand. USK had an “uninteresting” career; it was built at Bristol and completed in 1948. When completed in June that year, it made the short trip across the Bristol Channel to Cardiff, where it was to spend most of its working life as a mud hopper supporting local dredging work … first, as owned by the newly-formed British Transport Commission and, second, in 1963 transferring to its successor the British Transport Docks Board. In 1970, USK was sold to Murphy and it spent three years as an aggregates carrier on the Thames. On 5 September 1973 it arrived at Thos W Ward Ltd’s shipbreaking yard.